Our famous Sari Scarves are a class of tichel all their own – beautiful, unique, and forever popular! 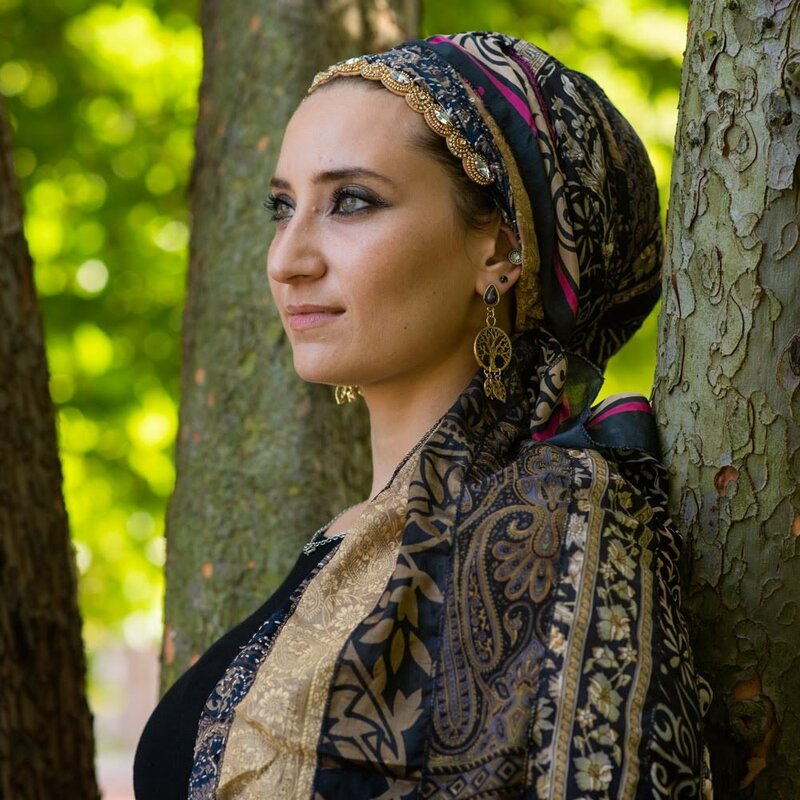 The Wrapunzel Harmony Scarf, sister to the classic sari, came next – a sari-style scarf that covers your whole head! Now there’s a new addition to the sari family: the Wrapunzel Melody! Please see the full product description below for more information, plus directions for choosing a color for your Wrapunzel Melody! Just like its relatives, the Melody is handmade in India using recycled strips of sari fabric in lovely varied colors and patterns. Like the Harmony, it’s a long rectangular scarf, wide enough to cover the head in one tie. What makes it unique? The gorgeous strips of fabric in the Melody are sewn edge-to-edge rather than overlapping each other, in a beautiful, smooth single line (hence its name, inspired by a single line of connected musical notes!). The resulting flat piece of fabric is much less bulky when tying, and features a wider strip of each color than an original sari or Harmony! Each one is completely one-of-a-kind, eye-catching, and incredibly beautiful. Our Wrapunzel Melody Scarf is composed of flat pieces of recycled sari fabric, sewn together at the edges to form one long, rectangular scarf. The material is the same bold, beautiful, varied fabric as our other sari family scarves, but the effect is totally different! You’ll enjoy how the Melody is more similar in feel to a traditional scarf, making for lots of fun tying possibilities. With slightly more of each piece of fabric to display compared to a traditional sari, it’s easy to feature your favorite strips. Try folding the scarf under, pleating the fabric, or using the same tricks you would use to show off a fancy border on a traditional scarf! What’s the best wrap style for the Wrapunzel Melody? Any of your favorites will do! Just use any tutorial that works for a long, rectangular scarf. 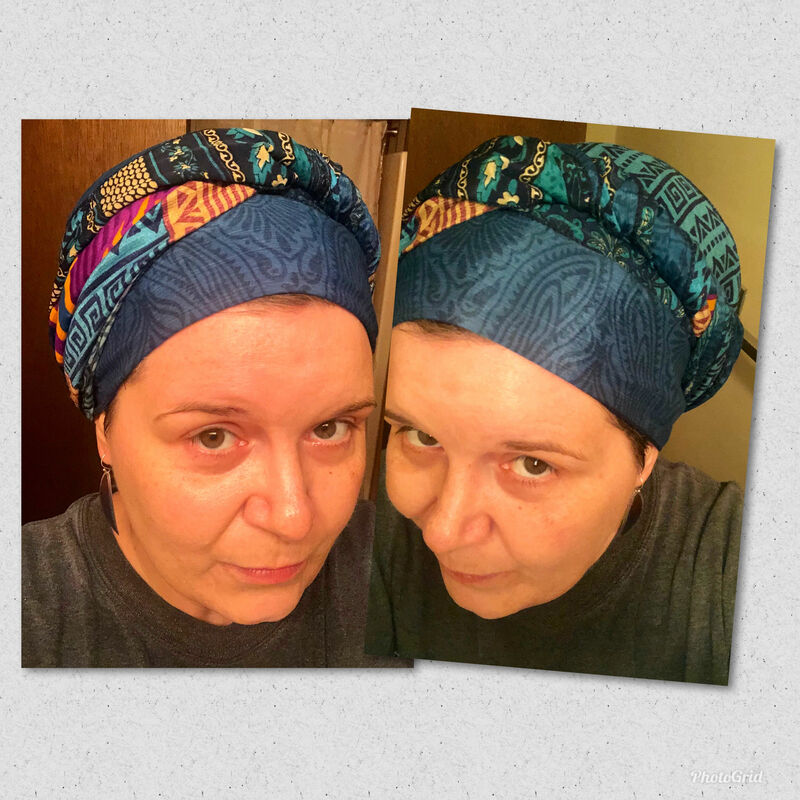 From a Regal Wrap to a beautiful Yael Twist, they’ll all look great! We have divided our Melody Scarves into general categories for easy ordering. The photos we have here display a sampling of that particular color category. You can let us know about any specific color or design requests by leaving a note with your order in the order notes box during checkout. The order notes box is right below the section where you enter your shipping information. We will do our best when packing to find the perfect one for you from our stock! Please note that the Melody you receive may not be one that you see in the photo, since each one is unique. I’ve had this scarf for just over a month now. I wasn’t that fond of it when I first laid eyes on it. After several attempts to tame this beauty, I found the layered, color combination that works for me. 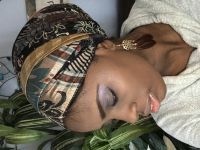 Pairing this scarf with my grand oaks earrings and pearly headband, I now feel like royalty! 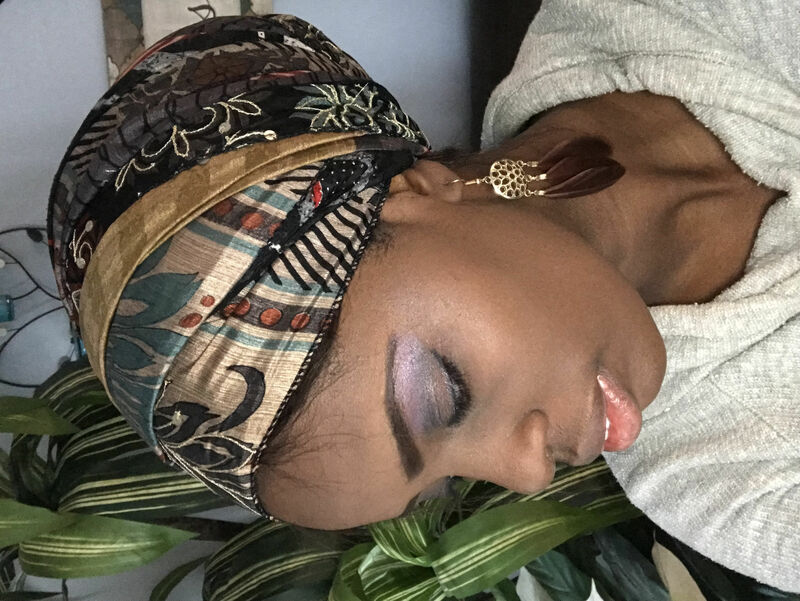 “WOW!” My first response when I laid eyes on my new “Jungle Mix Melody scarf.” The intricate designs and colors unite so beautifully in a unique harmony of it’s own tune! I paired this queen with a pair of “Wistful Way Earrings” in brown for a crowning touch. Thank you Wrapunzel! You ladies really know how to pick ‘em! When you can afford it, do not hesitate to purchase more than one sari scarf in colors you wear commonly: for me, blue, green, brown, teal and red. It is a luxury for one of your solids to be in olive, clear green and tan, with another in deep blues and aquas, for example. I have never met a sari that I hated. Received my Black Friday/Cyber Monday orders today. I feel like a little kid in a candy store! I bought the Melody scarf in several different colors. The Wrapunzel staff did an excellent job in the choices I received. These scarves are beautiful! And they are so light and easy to wrap. This blue one has quickly taken the lead as favorite scarf out of the entire purchase. The colors in it make my heart happy. ?. Thank you, Wrapunzel! I absolutely love this scarf! I’ve always had trouble with saris because of the way they’re made but not this one! And whoever selected it for me followed my detailed wishes to the letter! I just discovered and bought two Melody scarves – one in rich Autumn dark orange and one in various Autumn green tones. Each is as lovely as the Sari – but they are so easy to wrap and combine and they just make me happy!! These might be my new favorites! I love this scarf! It is so beautiful and lightweight and easy to wrap (I am relatively new to wrapping)! 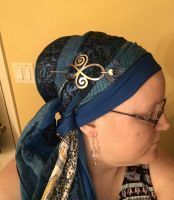 It is so versatile and the Wrapunzel ladies do an excellent job of matching your color preferences with the perfect scarf for you (mine was blues/turquoise)! They are very unique and I am definitely getting more! Love. True love. Sari scarves are my absolute favorites, but this Melody is even better!! I have a turquoise and an orange. They are more stunning than my imagination. They lay beautifully. Oddly, I don’t miss the fringe-like ends. So soft! The Wrapunzel ladies not only picked the PERFECT shades for me according to my request, but the included note was additional perfection. Just so you know, Wrapunzel is one of my best discoveries EVER!! The products are never ever less than fabulous, well designed, and of high quality. Customer service has no equal. The tutorials always boost my confidence that I ***CAN*** do this wrap! 🙂 I think the thing I love most about Wrapunzel is that perusing the site and watching the ladies’ tutorials and reading the blogs all feels like I’m just hanging out in my local (comic book shop, store, bar, favorite auntie’s house, etc) with people who can relate. It always feel like I belong. It’s always a positive space. 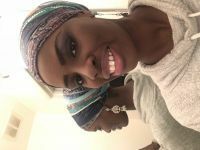 I can’t see myself going anywhere else — cyberspace or brick and mortar — to purchase scarves for the purpose of head wrapping. What lovely fun you share! A thousand thanks!!! I have about 15 various different tichels from this store and I am always amazed at my purchases. I have never been anything less than over the moon with their products. I have other tichels that are of lesser quality, not as attractive, and cost four times more. The customer service is also excellent. I have never had to wait longer than one week to receive my order. This is the only store I use now. So in love with Wrapunzel!!!! Gorgeous and easy to wrap. 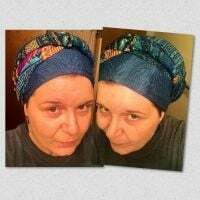 I wore it on a four mile hike, with a velvet headband and an omphtastic scrunchy, it was comfortable the whole time! I ordered the jungle mix with a rambling note on preferences, and I love the one that was chosen for me. I will more than likely be purchasing others, as I feel they would make amazing gifts for the women in my life, as well. Very pleased! The Wrapunzel ladies did an excellent job matching the request I made with the tichel they selected! My first Melody order I didn’t specify at all, and received a beautiful dark turquoise Melody. I also wanted one in the lighter, more green turquoise, and they sent another Melody just as beautiful as the first. I love them both! The Melody scarf caught my attention because my name is Melodie. I wasn’t sure how it would look on me. Wow!!! I get so many complements. Now I about to order my third one. I love it. If you are not sure I would say I highly recommend this scarf. I’ve often admired Sari scarfs on others, but I worried I wouldn’t actually like one on me. I was worried I couldn’t get all the layers to lay flat. When I saw the Melody was sewn differently, I was excited. Then I was worried (I do that a lot) since they are all unique. I’m picky about color and pattern. But I ordered and left a very long detailed note about what I wanted and didn’t want. When I opened my package I literally gasp. It was perfect for me! It was so beautiful and the wrapunzel team had picked out something that absolutely correlated with what I asked for. If you’re on the fence at all, don’t be. I think I need one in every color. They wrap a little differently than the original sari scarves, but once you figure it out, they are an absolute dream! Full, flat coverage. Every single one I have received (5 of them) is just stunning. I could not have chosen a nicer scarf for myself – love how the wrapunzel ladies always seem to know what color I mean on my order. Easy to wrap even for a beginner! Oh My Word! Words cannot describe the beauty of this scarf. It is gorgeous! I ordered the multicolor and it will literally go with everything in my closet! The colors are rich and beautiful. The fabric is a delight to touch. I may need to order one in jungle mix as well. Amazing! You betcha! Scroll down for the full story. “Yessss!!! !” This is exactly what we exclaimed when we found these sparkly headbands for you!! We just love them, and you will too! They are exactly the right size to give your scarf lots of extra sparkle without being overwhelming. They’re stretchy and will fit wherever you want it to go on your head! You’ll find them featured all over the site! They’re a real fascinator! Wear one on its own, or layer ’em up. This is one of those essentials that you’ll wear again and again! Eternal elegance in one head-turning accessory!